3.5 stars:This was a hard one for me to rate... I kept going from 3 to 4 and back again before I decided to go with the middle since I did enjoy the story and finished it in one day. Why 3.5 stars? The story to me was not what I expected and it frustrated me. Though I was happily surprised by other aspects. I thought I would be reading a love story between Leith and Aaron. In reality what I read was the story of Leith's life spanning decades with his group of friends and every now and again Aaron popping up. To me this was a story of life, growth and friendships. Interestingly not between Leith and Aaron. The romance was practically non-existent through the majority of the book and Aaron's actions never actually confirmed anything he said on the phone or in writing. He continued on with whatever he was doing and stopped long enough to send a letter saying how he cared about Leith. Oh sure, he called and ranted how he wanted to hurt Sean and blah blah blah after Leith ended up in the hospital. But then.... Nothing. In all his travels and postcards (which most of the time we don't know what was said because it was skimmed over without much detail) he couldn't drop in to see a friend who he claims so much affection and anger in what happened to him? And then when he does come he makes it clear his family had to beg him to be there for a wedding and how he had other things to do. Nice. Real nice. To be honest I don't think I really got any kind of feel for Aaron as a character at all because of how he was more or less in the background. When he did pop up I was ultimately unimpressed all the way around. Not to mention we don't see their relationship as friends in high school really develop at all. Ultimately I'm disappointed in the romance aspect. I didn't really care if they ended up together because I never felt invested. When they did end up together it was anticlimactic for me. What I did care about was Aish, Shahid, Grant and Josie and what they were going through - because the story actually gave them dimension and they were there. I loved their loyalty and their bond. How they supported, cared and accepted each other was amazing! These characters drove the story for me. Grant and Josie with their beautiful artistic minds and giving spirit with a laid back attitude until you hurt their friend. Aish and Shahid and their unwavering love and support while staying true to themselves and their beliefs. Aish and her bluntness in all things. Never one to sugar coat anything for Leith. Them... I loved. Overall an enjoyable read, if not what I was expecting. If you are looking for a book that focuses on life and friendships and how paths change and people grow together (and apart) I would say you would enjoy this book. If you are looking for a romance driven book... Well it wasn't my cup of tea. *copy provided to Bayou Book Junkie by author/publisher via Pride Promotions in exchange for an honest review*I really enjoyed reading this book. The book is written in kind of a memoir form, with Leith as the narrator. We see his life in High School, and College and through the years beyond, until his mid 30's. The other main character, Aaron leaves to go to college and we only see him once in the 15 years he is gone. There are a few letters, emails and PM's but he isn't a huge part of this story, until the very end. Most books would have skipped ahead to the present, but this author doesn't. She takes us through Leith's life through all the years and all his trial and tribulations he faces. She takes us through years of wanting Aaron and Aaron wanting Leith as well, but neither of them having the courage to make the first move. Even once they admit it, it still takes them years to act on it. I loved the plot. The story was very well written. I usually don't like books written in this form, but I really did enjoy it. The author captured my attention and held it. I was never once bored. The story flowed well and moved at a good pace. I loved the secondary characters. These were an amazing set of friends, and I think it's awesome that the meet regularly even into their 40's. The secondary characters were all well developed and added to the story nicely. So why not 5 stars, since I've gloated about how much I loved this book? I wanted more time in the present. I wanted to see Leith and Aaron's relationship develop. The last 20% is told with them as a couple, but in my opinion it wasn't enough. The relationship felt forced for a while. Until the very last scene I didn't feel the connection between Leith and Aaron like I thought I should. I think a few chapters could have been cut and more of them as a couple could have been added. I also never really felt that Leith grew up. He still felt like a little kid, living with his parents until his mid 30's, and only holding down two part time jobs. It seemed all his friends grew and moved on, and Leith was left behind still feeling like a college student. Leith needed more character growth, I think. This is my 1st book by this author, but I'll be looking into more in the future. I am so incredibly fortunate to have been able to beta read this story. LJ is one of my favourite authors because she has this brilliant way of creating characters who are so true to life, I feel as though I've grown up with them, and this book is such a wonderful example. 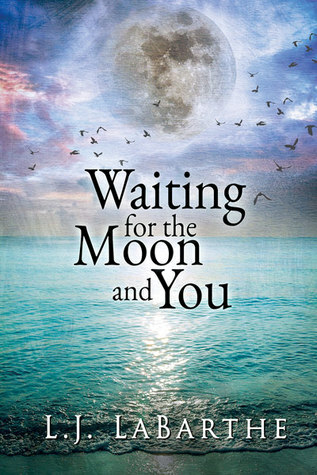 Waiting for the Moon and You is not your typical formulaic romance novel. You won’t find over exaggerated stereotypes or clichéd characters here. It doesn't follow the characteristic conventions that leave you wondering if you’ve read this book before. Instead, it's a story woven through years of friendship. While Leith and Aaron are the main characters, the secondary characters--their friends--shine just as brightly. It is beautifully written, gritty and heartbreaking, but hopeful, and if you’re looking for a story about friends finding their way to happiness and to each other, this is the book for you. Highly recommended! From a high school crush to a relationship nearly twenty years later, this is the story of Leith and Aaron. Labarthe creates a colourful group of friends and introduces them just as they leave school together. The group dynamics are great and I enjoyed watching the relationships change as they became adults. Aaron - the elusive, popular bad boy, is a fantastic romantic lead. His exotic life abroad is a striking contrast to Leith’s small, closed existence with his family and high school friends. Which brings me to my problem with the book. I didn’t like Leith. The book is his. He narrates and stars in the story of his own life. Or - more accurately - he just wallows in self-pity as life passes him by. He has the same routines with the same people in the same places for the duration of the book (or twenty years of his life) and he allows a single injury to curtail all his dreams and ambitions. Hell, he lives with his parents until he’s nearly 40. It is difficult to enjoy a book while despising the narrative voice of the hero. Leith isn’t presented as an unreliable narrator or a deliberate anti-hero - I think readers are supposed to like him and empathise with him. But by the time he finished telling his story - I absolutely loathed him. I was given a copy of this book in exchange for an honest review. A Joyfully Jay review. 3.75 starsThis story is told through a series of flashbacks. While the blurb suggests that this is a typical romance story, readers should know that the romance between Aaron and Leith doesn’t really appear until almost 2/3 of the way through the book. The majority of the book is Leith’s story of how he survived 20 years of not being able to be with the love of his life. In high school Aaron and Leith both had crushes with each other, but had to keep it secret. After high school, Aaron heads off to college and then settles in Hong Kong while Leith attends a local school and stays in their hometown where he ends up in an abusive relationship. After being horribly injured, Leith avoids becoming involved with anyone; instead he relies on his family, friends, and the occasional phone call or letter from Aaron. By the time Aaron returns, Leith struggles with wanting to believe Aaron is there to stay and wondering why Aaron would want to be with him as damaged as he is.Read Wendy’s review in its entirety here. Original review on Molly LollyThree and a half stars!I got so caught up in the story and couldn’t put it down. The characters are amazing and so well developed. They became a family in their own way. I loved watching how they all took care of each other in their times of need. They never hesitated. Aaron and Leith were kept apart by a string of circumstances that got old after a while. The first five or six years apart I could almost understand. After ten it just got tragic. When they were still kept apart until after fifteen years I had to wonder if they truly loved each other as much as they claimed. There wasn’t much growth on their part beyond simple aging. I wanted to like the book more since it’s so well written, and the characters are likable. I just needed more reasons why they were apart so long and fell together so easily when they magically could be together finally. The story line in this one simply didn't flow. The way it jumped from past to present was choppy and disjointed. That gave a detached impression of the characters that lacked chemistry.I rarely did-not-finish a story, but I gave up on this one 3/4 of the way through because it wasn't going anywhere for me. A truly delightful story of slow-burn love. I really enjoyed this. L.J. LaBarthe - L.J. LaBarthe is an Australian woman living with disabilities and her cat. She has always loved books, music, and daydreaming. She has written stories since childhood, often drawing pictures to accompany her tales. She won a competition for drawing a picture of Australian Humpty Dumpty, complete with Aussie hat when she was a young child. The drawing was accompanied by an adventure story with Humpty Dumpty she wrote set in Australia. From that moment on, she has not looked back.She spends her free time watching television and is an unashamed fan of 'Supernatural,' 'Spartacus' and 'Game of Thrones.' She reads newspapers online for fun and loves a good novel. She loves to cook and enjoys a snifter of absinthe from time to time.L.J. would like to take a moment to let her university professor in creative writing know that knowledge of iambic pentameter isn't necessary in order to be able to enjoy the craft of writing, no matter how much he may have screamed to the contrary.